The idea of hijrah or migration has a special place in the history of Muslims. It denotes the flight of Prophet Muhammad and the early Muslims to Medina to take refuge from persecution in the then pagan Mecca. Today, the idea of hijrah has however been given its own interpretation by Muslim extremist groups. They use it to argue in favour of the isolation of minority Muslims from the larger non-Muslim community. It is also used to encourage Muslims living in a non-Islamic environment to migrate and live with the “jihadists” who supposedly live the life of the pious pioneers of Islam so as to establish a better Muslim ummah or community. A glimpse of this idea was provided in the White Paper report on the Jemaah Islamiyah (JI) members in Singapore which reported that one of the JI leaders had sent a letter to Mullah Omar, the former head of the Taliban government in Afghanistan, asking whether Muslims (members of JI) should migrate to Afghanistan. Some Muslim extremist groups criticize Muslims who settle down in non-Muslim countries and call them to migrate instead to a Muslim country. There are also extremists who label these Muslims as disbelievers just because they live in a non-Muslim country. With regard to the current problem posed by ISIS, it is very clear that hijrah is one of many Islamic concepts which has been abused and given importance by ISIS in order to mobilize Muslims all over the world into joining jihad in Syria and Iraq and supporting the newly established “caliphate”. Just a month after proclaiming the “caliphate”, ISIS published its third edition of its online magazine, Dabiq, with hijrah as its main theme. According to ISIS, jihad which is regarded as a personal obligation (fardhu `ain) of all Muslims today due to the occupation of Muslim lands by non-Muslims can only be fulfilled via hijrah, “There is not life without jihad and there is no jihad without hijrah…. This life of jihad is not possible until you pack and move to the Khilafah [caliphate].” In other words, a neglect of hijrah is a neglect of jihad and unwillingness to make hijrah is a sign of weak commitment to jihad. “Therefore, every Muslim professional who delayed his jihad in the past under the pretense of studying Shari’ah, medicine, or engineering, etc., claiming he would contribute to Islam later with his expertise, should now make his number one priority to repent and answer the call to hijrah, especially after the establishment of the Khilafah. This Khilafah is more in need than ever before for experts, professionals, and specialists, who can help contribute in strengthening its structure and tending to the needs of their Muslim brothers. Otherwise, his claims will become a greater proof against him on Judgment Day. Muslim extremist groups build their view of hijrah on a premise that living in a non-Muslim country is wrong because Muslims will have to live under un-Islamic conditions. They also claim that Muslims who willingly accept the rule of non-Muslims, and live under any rule other than the shariah (Islamic law), in all circumstances, are committing acts that will nullify their faith. For the extremists loyalty and sovereignty can only be given to and by God and Islam is the only way of life for Muslims. The flight of Muslims from non-Muslim countries to Syria and Iraq in thousands partly testifies to the potent of ISIS mobilization appeal tapping on Islamic concepts already familiar and available among Muslims, although it must be admitted that causes of radicalization remains too complex to be attributed to religious ideas only. However, the above-mentioned idea of hijrah, if accepted, has other serious implication to Muslims who are not making hijrah to Syria and Iraq. The consequence of this thinking is the idea that one cannot be a proper Muslim unless one lives among Muslims only. Such thinking encourages ghettoism and an exclusivist attitude in social life. This may not be a security problem, but it is surely a theological problem and could become a social problem that must be addressed. It is argued that the verses (4, 97-9) cannot be used as absolute proof that Muslims cannot live in a non-Muslim country. On the contrary, it could also be interpreted otherwise, that is to allow a Muslim to do so. The verse, “Except the weak ones among men, women and children who can not devise (a) plan, nor are they able to direct their way.” (4:98), has been interpreted by Muslim scholars to mean a Muslim is only required to migrate from a non-Muslim country if he is unable to practice his religion freely and is being oppressed. Consequently, it also means that Muslims are allowed to live in a non-Muslim country or under a non-Muslim government, as long as they have the freedom to practice their religion and can experience basic human rights. There is no reason or compulsion for Muslims who live in such a situation to migrate. This interpretation is supported by the fact that the Prophet himself permitted his uncle, Abbas to remain in Mecca, which at that time was not under Muslim rule. That proved that the injunction to migrate was not binding over every Muslim. Secondly, the migration of the Prophet’s companions to Abyssinia (Ethiopia) and their return six years after the Prophet’s migration to Medina, also suggests that migration is only necessary for those who are weak and fear religious persecution. Therefore, living in a non-Muslim country is allowed if a Muslim’s right of worship is protected. Fourthly, the Prophet said (in one narration by Imam Muslim), that those living in a non-Muslim country who later became Muslims could still remain living there and did not need to migrate. From the evidences, it can be concluded that there cannot be a general ruling for or against Muslims living in a non-Muslim countries. The ruling depends on the status of the individual and the context. Clearly then, any position prohibiting Muslims from living and settling in non-Muslim countries is not the consensus of Muslim scholars. The scholars are of the opinion that a ruling on migration depends on the situation and can be summarized as such: a) it is obligatory for a Muslim to migrate if he or she cannot practise his religion and fears that he cannot maintain his faith (4:97-9); b) Muslims who can practice Islam and can afford to migrate are only encouraged to do so. This is based on the actions of the Prophet’s uncle, Abbas and his companion, Abu Nu’aim; c) Muslims who cannot afford to or face difficulty in migrating are not required to do so and can remain living in that country (4:97); and d) it is obligatory for a Muslim to remain in a non-Muslim country if his presence and expertise is required by the Muslims there. In today’s context, migration to a Muslim country in a classical sense is no longer relevant or practical as no particular country today can be truly classified as a Dar Al-Islam (land of Islam) in the classical sense. Furthermore, the world has been globalized. Any attempt to isolate Muslims from other communities in order to preserve their faith and commitment to the religion is a futile effort. Also, there is no one country, be it a non-Muslim or Muslim country, that is perfectly suitable to meet the original objective of migration, which is to allow a Muslim to practice Islam as a religion comprehensively. Practically anywhere a Muslim chooses to live, he still has to make the appropriate adjustments and accommodations to his society. The early Muslims traveled and settled widely, from their origins in the Arab world to continents such as China and the Malay Archipelago. In each case they settled and lived with the non-Muslims, which eventually caused the spread of Islam. Muslim minorities living in non-Muslim democratic countries must realize that whatever the imperfections, remaining in these countries is critical. By doing so, they provide abundant opportunities to share their Muslim way of life and dispelling any misconceptions about Islam. In that respect, instead of isolating themselves, Muslims must strive to actively engage with their host society by being a constructive member of the country. An active participation in the nation’s progress and development is the strongest argument against the negative image of Islam. This can be achieved in part by living in accordance with the principles of democracy and the law of the state. This will assist Muslims in building a foundation for peaceful coexistence with others. Muhammad Haniff Hassan is a Fellow at S. Rajaratnam School of International Studies, Nanyang Technological University, Singapore. This article is an improvement of the original version in Muhammad Haniff Hassan, “Responding to the Idea of Hijrah (Migration)”, Strategic Currents: Emerging Trends in Southeast Asia, edited by Yang Razali Kassim, RSIS, Singapore, 2009, pp. 176-9. Pergas, Moderation in Islam in the Context of Muslim Community in Singapore, Singapore: Pergas, 2004, pp. 226-7; Muhammad Sulaiman Tubuliyak, Al-Ahkam Al-Siyasiyah Li Al-Aqalliyat Al-Muslimah Fi Al-Fiqh Al-Islami, Amman: Dar Al-Nafais, 1997, pp. 61-6. The White Paper: The Jemaah Islamiyah Arrest and the Threat of Terrorism, Ministry of Home Affairs, Singapore, 2003, pp. 34-5. `Abd Al-Rahman bin Mu`alla Al-Luwaihiq, Al-Ghuluw Fi Al-Din Fi Hayat Al-Muslimin Al-Mu`asirah, Bayrut: Muassasat Al-Risalah, 1992, pp. 308-9. 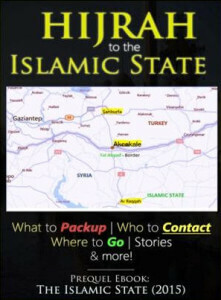 Inspire (Al-Qaeda online magazine), no. 13, pp. 32-3; `Abd Al-Rahman bin Mu`alla Al-Luwaihiq, Al-Ghuluw Fi Al-Din Fi Hayat Al-Muslimin Al-Mu`asirah, pp. 306-9. Muhammad Sulaiman Tubuliyak, Al-Ahkam Al-Siyasiyah Li Al-Aqalliyat Al-Muslimah Fi Al-Fiqh Al-Islami, Amman: Dar Al-Nafais, 1997, pp. 66-72. Cited by Muhammad Sulaiman Tubuliyak, Al-Ahkam Al-Siyasiyah Li Al-Aqalliyat Al-Muslimah Fi Al-Fiqh Al-Islami, p. 54. See Majallat Al-Azhar, vol 6, 63rd year, Jumada Al-Akhirah 1411H, December-January 1991, p. 618. Pergas, Moderation in Islam in the Context of Muslim Community in Singapore, pp. 233-6.